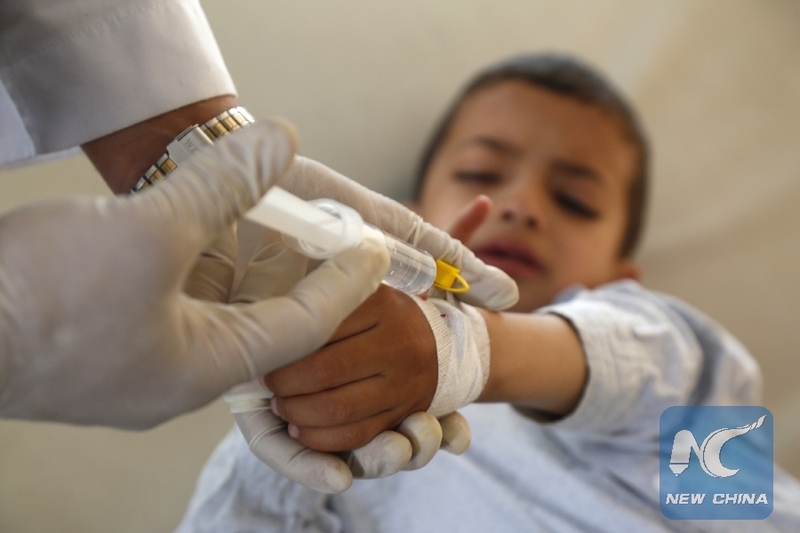 SANAA, Sept. 3 (Xinhua) -- Fear of a possible third deadly wave of cholera is rising in Yemen, as a public hospital in Sanaa is receiving over 60 suspected cases of the epidemic each day, mostly children. The United Nations humanitarian agencies have recorded more than 1.1 million suspected cases and more than 2,300 associated deaths since April last year, labeling the country with "the largest outbreak on record." Al-Sabeen Maternity and Child Hospital in Sanaa is filled with groans and cries of children and mothers suffered from the epidemic, sounding the alarm over the most humanitarian tragedy of the country in the modern age. Lujain Muammar has been lying on the hospital bed in the intensified care unit of the cholera treatment section for several days. "She began crying after we had a lunch at a house of our relatives ... and then she went into persistent vomiting and watery diarrhea," Fatima, the mother of the six-year-old girl, told Xinhua. "Her legs were then cramped and she went into coma ... we quickly brought her here," the mother recalled, sitting beside Lujain. The father, Muammar, was a government employee and relied on his monthly salary until the deadly civil war broke out in March 2015. He has since become jobless like hundreds of thousands of Yemeni civil servants who gone largely unpaid due to the war. Lujain's doctor Ismail al-Mansour said the girl was badly infected with cholera and unfortunately, she is also malnourished. "Lujain needs a long-term treatment from both cholera and malnutrition and she must remain in the hospital under close medical observation," the doctor said. At the time, Tahir al-Refaei was rushing down the hospital corridor to the cholera treatment section, carrying his wife in his arms. "Please help," al-Refaei told the doctors while putting his wife on the bed, and the doctors immediately started examinations on her. "She has been suffering from severe diarrhea and continuing vomiting all the night, so I rushed her here," al-Refaei said. He told Xinhua that a female relative of his family died four days ago from the cholera infection. The family did not take her to the hospital and she died after the disease led her to dehydration and kidney failure. Nearly all beds in this hospital suite were occupied by children and young girls. Doctor Adel al-Almani, the head of the cholera treatment section of the hospital, told Xinhua that the section receives an average of 60 to 70 suspected cases everyday, mostly children under the age of seven. "I notice that the numbers of infected cases are increasing recently," doctor al-Almani said. Nearly 25 million Yemenis have been lacking access to clean drinking water since the war erupted. Moreover, it has since become a common sight to see piles of garbage mingled with stinking green watery filth littered the streets across the neighborhoods, causing the spread of major fatal diseases. Last week, Peter Salama, deputy director-general of emergency preparedness and response of the World Health Organization, warned that the war-torn country is still vulnerable to the spreading epidemic. "We've had two major waves of cholera epidemics in recent years, and unfortunately, the trend data that we've seen ... suggests that we are maybe on the cusp of the third major wave of cholera epidemic in Yemen," Salama said.